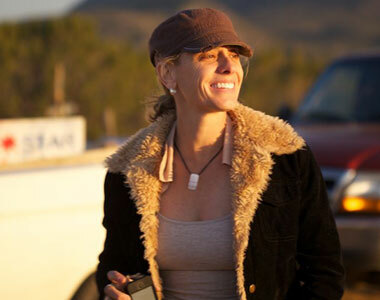 “Ocean Keeper” director Eileen Olivieri Torpey. Photo by Gabriella Marks. THIRTEEN recently spoke with Eileen Olivieri Torpey, director of the upcoming Treasures of New York episode, Ocean Keeper. The documentary delves into the rich history of the Amagansett Life-Saving Service Station on Long Island and its various functions throughout the years. Coincidentally, our interview with Ms. Torpey took place on the day that Hurricane Sandy hit the New York area and wreaked havoc along the Northeast, including the Long Island shoreline. Torpey draws a parallel between Sandy and the Great Storm of 1938, which the Amagansett Life-Saving Service Station also survived, and says she is reminded of the tremendous efforts of the U.S. Coast Guard during these times. Here, Torpey talks about her inspiration for the film, and the vital role life-saving stations played in Long Island’s history. Treasures of New York: Ocean Keeper premieres Thursday, November 1 at 8:30 p.m. on THIRTEEN and Saturday, November 10 at 9:30 p.m. on WLIW21. Ms. Torpey answered our questions via email. What first interested you in making a film about the Amagansett Life-Saving Service Station? The Executive Producer, Deborah Carmichael and I had been working together on various video related projects since 2006. When I heard about her family’s summer home in Amagansett, NY and how it had once been a life-saving station, I became interested in its history. Then in 2007, the family decided to give the house back to the Town of East Hampton for historic preservation and in doing so, moved this gorgeous, regal building back to its original site on Atlantic Avenue — this is where the film really began. Unfortunately, I wasn’t able to be there on the day the house was moved, but we had cinematographer Jerry Pantzer document the event. When I saw the footage and heard stories unfold, I just knew there was a wonderful film to be made. Production began officially in 2011 after a committee to restore the station was formed. The committee hopes that the film will help with the restoration efforts. Some day, the town is planning to make the station into a life-saving museum. The Amagansett station is known as the last of 30 life-saving stations built along the South Shore of Long Island. Is it known what happened to the other stations? What role have life-saving service stations played in Long Island’s history? Photo courtesy of Pure Newt, L.L.C. What I love most about this film is that it brings together largely unknown histories that at first glance might seem disparate. We dedicated the film to the men who risked their lives to save strangers, to coast guardsman John Cullen, who reported the Nazi saboteurs, and to Joel Carmichael who rescued and preserved the historic building for forty years. For me, the primary undercurrent in the film is generosity and courage. The U.S. Life-Saving Service was established in 1871. By 1915, 186,000 lives had been saved along the East Coast, West Coast, Gulf and Great Lakes area. The commercial shipping on the South Shore of Long Island was prolific and without these stations, more lives would have been lost. 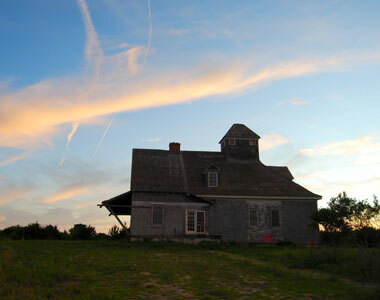 The U.S. Coast Guard took over the U.S. Life-Saving Service in 1915 and there are still a few active USGS stations on Long Island as well as other stations that have been converted into stores, churches, private residences, community centers, hotels, etc. During the making of this film, is there anything you were surprised to learn about the station, including its various uses over the years? There were many surprises, but first, I remember being in the middle of my interview with David Carmichael and he started telling the story of the Nazi saboteurs. I was floored. How could it be that I didn’t know this important part of U.S. history? Nazis on U.S. shores… really? That was a great moment. I also remember during my interview with Isabel Carmichael hearing for the first time about the well-known artists and writers who used to drop by their father’s house frequently — Willem de Kooning, Harold Rosenberg, Saul Steinberg and Constantino Nivola. Second, it was suggested that I contact Milton Miller. As it turns out, Mr. Miller is a 13th generation Amagansett resident and his father worked at the station. Their family’s house was very close to the station, so as a child he would walk over and visit his father while he was working. He shared three hours of memories during our interview — his mother making food, his father saving lives. It was quite an interview. What was the most challenging part of making this documentary? It was challenging to portray the Nazi saboteur story accurately. There are a lot of different versions out there, so my research was pretty elaborate. I ended up using a combination of Michael Dobb’s book, “Saboteurs: The Nazi Raid on America,” an interview with coast guardsman John Cullen, and consulted with several local and east coast historians including Richard Barons at the East Hampton Historical Society and Robert Hefner, Historic Preservation Consultant. Originally, I thought we would create a reenactment on the beach where the Nazis were found in 1942, but instead I decided to hire artist Melinda Morey to draw the scene. I really love this part of the film and I think the drawing adds a lot to this story. Another challenge I encountered was how to creatively move between different time periods in history. My editor, Debra Anderson, was great. She was willing to experiment with the structure so that we found a good landing place in the overall story arch. We received a lot of feedback from people who felt that the footage of the house move in 2007 was very compelling, and so we decided to use it as a thread throughout.